There are multiple ways to approach your job search, and they don’t necessarily have to start with a clearly defined job description. Job seekers often tell me that their biggest challenges are around establishing their starting point and strategy – What am I looking for, and how do I find it? 1) Those with a very defined and linear career path within a certain specialization that they continue to build upon. For example, a graphic designer, who becomes a senior designer, and eventually an art or creative director. Their challenge is in understanding what differentiates them in comparison to their competition, who likely has a similar background and skill set. 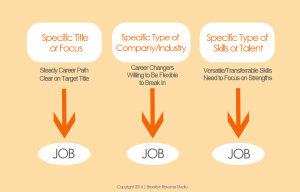 2) Career changers looking to shift focus entirely, whether it’s the type of job, the type of industry, or both. For example, someone with a 10-year career in corporate marketing who now wants to focus on non-profit fundraising work. Their challenge is in identifying the transferrable skills that will get them in the door, and selling those skills in a way that is going to position them as competent, able to easily adapt, and worth the investment when up against folks with previous hands-on industry or job experience. 3) Those who define themselves and their careers by their portfolio of versatile and transferrable skills. These people have generally held different types of jobs that don’t fit into a singular category, and have a diversified range of skills and talents. Their challenge is in how to connect all of those dots and package those different skills to fit a particular job description. They may have a generalized skill-based resume, as well as multiple versions of the resume tailored to highlight each of their core skill sets. It’s less important that you fit yourself completely into one of the 3 job seeker profiles than it is to recognize the challenges you’re facing in your own career scope, and how that translates into the best type of strategy for conducting your search. You know exactly what you want (for the most part) for the title or job description that best suits you, the level of experience and compensation, and the type of environment, industry or organization to which that role, and you, are best suited. 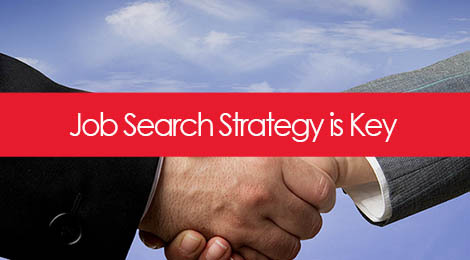 Your strategy revolves around searching jobs based on title, whether it’s through a job board, a referral basis, researching openings via company websites, or setting up Google alerts. Networking is easy for you because you have a clear idea of the message you want to communicate about yourself and what you want others to know about you. This type of strategy is best suited for the person who is less clear on the job title they want but very certain they would fare best in a certain type of environment, such as a startup, a creative agency, or the non-profit sector. Your job search is based around finding that perfect culture fit, and you’re likely willing to take a lower paying or more entry-level role to get your foot in the door with a great company, possibly one you can grow with and learn from. Networking can be key, as it may take a credible referral paired with a great resume to help you break through the lack of experience barrier. You have a wide set of skills that would position you well for several different types of jobs, but you don’t want to come off as a jack-of-all-trades and master-of-none. You may be less concerned about job title and the type of company, as long your next position allows you to leverage a certain talent or group of skills. The key to being competitive is in narrowing down that list to a more specific focus and tailoring your resume appropriately. Identify your top 3 or 4 strengths, and then use that to drive your search by looking at where those skills would bring value to an organization. The goal is to gain clarity so that you’re not throwing mud at the wall and seeing what sticks. It requires a little more research on your end to narrow down the possibilities and get a sense of where you “fit”, but it will help you feel more in control of your search and sell yourself more effectively. The key to choosing the best job search strategy is in getting clear around your unique challenges and core interests. What piques your interest the most. Is it the title/level/salary, the type of skill involved, or the culture fit? What poses the biggest hurdle for you, and what do you need to overcome it? How will understanding that challenge help you market yourself more effectively to that desirable criteria? It’s all about building clarity, and while that can take time, you are positioning yourself for a much greater level of success (and much less frustration and overwhelm) in your search. How can we help take your career further? See our resume or branding services to help guide you. Tags: branding, career, design, job search, marketing, personal branding. Bookmark the permalink.